As a black conservative and Republican, Allen West is not your typical Tea Party member. West rode the Tea Party wave all the way to the U.S. House last November from Florida’s 22nd congressional district. He is the first black Republican to represent Florida since Reconstruction. But in addition to being a member of both the Tea Party Caucus and the Congressional Black Caucus, Allen West is also a Tea Party statist. Before his election to Congress, West was a lieutenant colonel in the army until his retirement after an investigation into his harsh interrogation techniques while fighting in the Iraq War resulted in a $5,000 fine. After his “service” in the military, West worked for a defense contractor as an advisor to the Afghan National Army. He run unsuccessfully in 2008 for the congressional seat he now holds. After speaking at CPAC in 2010 and being endorsed by Sarah Palin, West won the 2010 election against the same Democratic candidate who had earlier defeated him. He was the keynote speaker at the recent 2011 CPAC. West is a favorite of Tea Party members for his attacks on President Obama and government spending and his support for the military and the war on terror. I have never been too impressed with the Tea Party movement, especially when it comes to issues like the war on drugs and U. S. foreign policy. And although most Tea Party supporters claim they are opposed to big government, in poll after poll a majority of Tea Party Republicans say they have a favorable view of former president George W. Bush. The George W. Bush who doubled the national debt, gave us the first trillion-dollar deficit, drastically expanded Medicare, and not only began two wars that unnecessarily shed American blood and drained the treasury, but waged another war on the domestic front””on the Bill of Rights. I don’t know how West feels about Bush, but I do know that he is a Tea Party statist who supports the welfare state, the warfare state, and the national security state. I want to briefly look at these in reverse order, focusing mainly on the welfare state that West would claim to oppose. West voted in February three times in the affirmative on H.R. 514 to extend the PATRIOT Act. This is the nefarious legislation hurriedly passed soon after 9/11 with no debate in the House and only minimal debate in the Senate that Judge Napolitano called “the most abominable, unconstitutional governmental assaults on personal freedom since the Alien and Sedition Acts of 1798″ and “the most unpatriotic of the things that the Bush administration and this Congress could have visited upon us.” Thank you Mr. West. Increasing the size of the military will naturally entail an increase in defense spending. But how much defense spending is enough? The United States already spends on defense as much as the rest of the world combined. The true amount of U. S. defense spending is already over $1 trillion a year. It should come as no surprise to see that Congressman West recently voted against H.J. Con. Res. 28, “Directing the President, pursuant to section 5(c) of the War Powers Resolution, to remove the United States Armed Forces from Afghanistan.” Is there any U.S. war he wouldn’t support? Is there any U.S. military intervention he would oppose? It is unfortunate that someone who rails against out-of-control government spending and promises to carry the torch of conservative, small government principles with him to Washington is also a supporter of the welfare state. First of all, when West addressed CPAC, he said federal spending should be capped at 18 percent to 20 percent of GDP. But why? All this does is ensure that federal spending will be at 20 percent of GDP no matter what GDP is. The whole statistic is meaningless. There is no necessary connection between the two figures. Spending as a percentage of GDP is generally used just to defend increased government spending. According to the Office of Management and Budget, federal spending as a percentage of GDP was 23.8 percent for fiscal year 2010. Now, 20 percent is certainly more desirable than 23 percent, but it is still higher than federal spending as a percentage of GDP during five of the eight Clinton years. It would still entail multi-trillion dollar budgets bloated with unconstitutional spending. And third, West announced in another press release dated March 16 the awarding of a $21 million federal grant to the Fort Lauderdale-Hollywood International Airport in his district. The airport director was “very glad that Congressman West was able to help us make this happen.” It seems that the airport needed a “second commercial runway.” Yet, the Fort Lauderdale-Hollywood International Airport “is ranked among the top 25 airports in the United States” and has “experienced 18 consecutive months of passenger growth.” It is also ranked “as one of the fastest growing major airports in the country.” With all this business, it seems as though the airport wouldn’t need a federal grant to expand. The real issue, though, is the federal government’s constitutional authority to fund airport expansions. According to the nature of our federal system of government, the enumerated powers of Congress in Article I, Section 8 of the Constitution, and confirmed by the Tenth Amendment, the federal government has absolutely no authority to fund the construction, development, maintenance, remodeling, or expansion of any airport or any other non-federal building, structure, or piece of land. If any entity besides the owner of the airport, the airlines that do business there, the customers that use the airport, individual philanthropists, or a group of investors is going to put money into the expansion of the airport it would have to be the state of Florida, not the federal government. 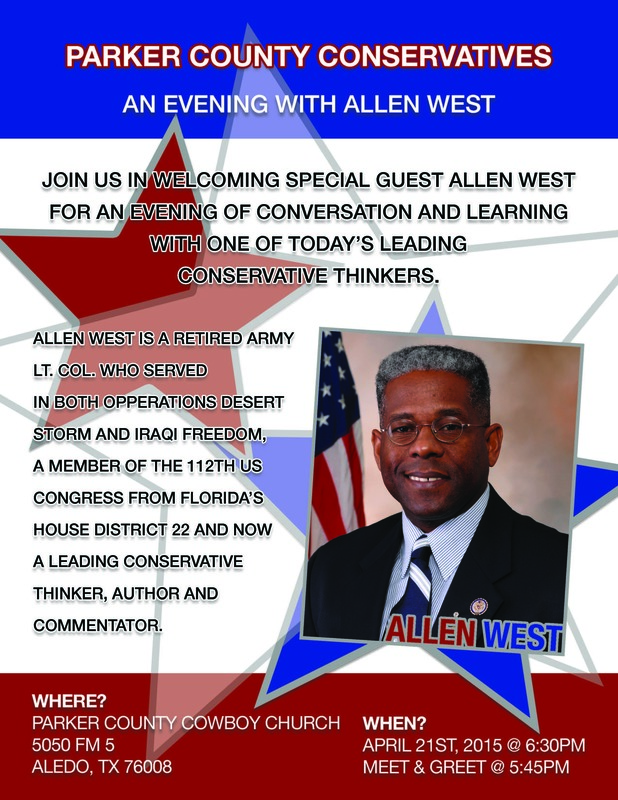 Apparently, Allen West is opposed to out-of-control federal spending except when it benefits his district. It is hard to tell how much more of the welfare state that Representative West supports. On his website he lists twelve issues: Congressional Issues, Defense and National Security, Economy and Jobs, Education, Energy, Financial Services, Foreign Affairs, Health, Spending Cuts and Debt, Tax Reform, Transportation, Veterans. Three of them have no links and six of them have links to a statement that says to contact his DC office for more information. Only the issues of Defense and National Security, Economy and Jobs, and Energy have links to his positions on these issues. Allen West may be highly educated, he may be a decorated war veteran, he may be a devoted family man, he may be a courageous black man who identifies as a conservative, he may be better than all the Democrats in Congress, but he is still a Tea Party statist. Laurence M. Vance [send him mail] writes from Central, FL. He is the author of Christianity and War and Other Essays Against the Warfare State and The Revolution that Wasn’t. His newest book is Rethinking the Good War. Visit his website. “If you consider yourself a” Neo-Con globe-trotter for the Empire who has never met a war you didn’t like…who never met a foreigner you didn’t want to drone to death…who never knew of a foreign country with abundant natural resources that you didn’t want to secure for your biggest campaign contributors, U.S. corporations…who enjoys carrying the foreign policy water for Israel…please come spend an evening with a “conservative”, yes…a “thinker”, no…a RepubliCON capable of regurgitating the approved party lines for “eternal war against any and all”. Yes, you too can “rub elbows” with Allen “Jack Bauer” West. Fuhrer West will also bring a surprise guest as well…a captured freedom fighter…er…a rogue terrorist. The specific country this terrorist was captured and renditioned from doesn’t matter…if he’s not an “exceptional Amerikan”, he doesn’t matter and is not human anyway. Raffle tickets will be sold on site, the winner of which will get to “knee-cap” this brazen savage terrorist who dared to attempt to defend his country invaded by the U.S. Empire with a “Curtis Lemay Commemorative .45 Automatic”. “24” actor, Kiefer Sutherland, will be on hand to video record your own “Enhanced Interrogation” event to proudly demonstrate to your friends and family your personal commitment to the “100-year” Global War on Terror (GWOT) as former Secretary of Defense and PNAC (Project for a New Amerikan Century) member Donald Rumsfeld described it. Also, please bring your military-age (or soon to be!) children and grandchildren with you to this event. Allen West will be signing up your progeny for the honor of participating in more Amerikan “Boots on the Ground” for any of three beautiful locations throughout the world in the ongoing “Global Wars Without End”…Iran, Ukraine, or Syria. Dim-ocracy and eternal servitude to the U.S. Empire. Israeli Prime Minister Benjamin Netanyahu will be on hand to award each young Amerikan who signs up for service in the “Future Foreign Wars For Israel” a “Christian Zionist” medal for allowing young “Jewish Zionist” boys in Israel to stay safely at home with their loving families. Bring your checkbooks too! “Freedom isn’t free! !”…especially in Israel. The blood of your children isn’t enough…nor is the large amount of U.S. foreign aid paid for with more and more Amerikan debt…they need your savings as well. West betrayed his Tea Party roots, and they, en masse`, abandoned him when he ran for reelection – and he lost. His neocon true nature came out as soon as he went to DC, and Florida Tea Party folks knew they had been betrayed. ” Fool me once- shame on you ….Fool me twice- shame on me ” was their attitude. He is a glib, smooth-talking one-trick pony ( statist big government ) with lots of clever ” sound bite ” material for the “Faux Noise”…..err Fox news crowd droolers.